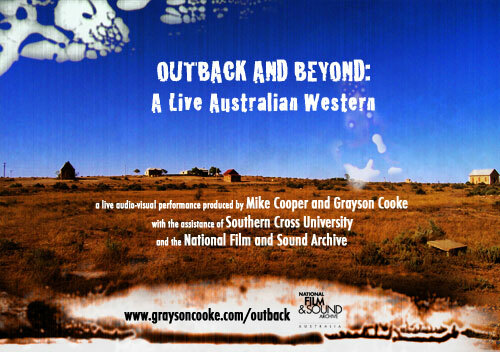 “Outback and Beyond” is an audio visual collaboration between Mike Cooper and Grayson Cooke. A meeting of cultural and musical traditions as much as a melange of digital and analog media; to Mike’s soundtrack of deconstructed Blues, lap-steel guitar and processed electronics, Grayson performs a live re-mix of archival footage of the Australian outback, from titles held by the National Film and Sound Archive. Mike Cooper also sings a libretto, with text culled Burroughs-cut-up-style from a book written by journalist Alice Thompson, the great grand-daughter of Charles Todd, the man responsible for putting the telegraph across Australia in the 1870s. The source of the libretto is a book by Alice Thomson – great great grandaughter of Charles Todd – called “The Singing Line.” In 1855, Charles Todd and his young bride Alice-for whom Alice Springs was named- left Victorian England for the wilds of South Australia where he took up the post of Government Astronomer and Superintendent of Telegraphs. At the time South Australia was a place so isolated that letters from home took five months to arrive. It was Charles’s dream to improve this situation. In 1870, Todd and an army of men, supplies, and Afghan camels set out with the intention of running a telegraph line–“the singing line”–from Adelaide in the south to Darwin in the north. The libretto is non- narrative and is fashioned in the manner of Brion Gysin and William Burrough’s books using ‘cut-up’ techniques and random association of words and sung in a postmodern version of the ‘folk ballad’ – or ‘folk opera’ accompanied by my lap steel guitar and live electronics. The music – both sung and played music – is freely improvised – hence different at each presentation. The order of the words of the libretto can be also randomly changed as well, rendering each performance of ‘Outback and Beyond’ visually and sonically different and unique. This project has been supported by Southern Cross University and the National Film and Sound Archive. Footage from “The Inlanders” and “A 5000 Mile Journey Across Australia” used with permission of Frontier Services. Footage from “Back of Beyond” is used with the generous permission of the John Heyer estate. 2012 ; >>> April 18th, Southern Cross University, Lismore. Australia. Grayson Cooke and Mike Cooper also collaborate on other audio visual projects as Tystero System. Que Viva Mexico – Oktober Orkestra Version.